HERE’S THE RISK. If you ignore the affluent over 50s in favour of younger people living on digital platforms, you will miss a great opportunity for your business. Did you know over one third of the UK’s population is over 50? We are living longer. The view we have of ourselves is also changing. Almost half of 60-64 year olds consider themselves in ‘middle adulthood’. The affluent over 50s account for 80% of UK personal wealth. If you are marketing a small business these changes ought to be important to you. Marketers and their agencies too often have played on words that suggest people below 50 are ‘doing’ and those over 50 are ‘done’. With 80% of agency staff below 40, it’s not difficult to see why they cannot see the wood for the trees. The over 50s are a diverse bunch. Use the Sir Terry Wogan ‘how many listeners do you have?” test. Answer, one. His radio broadcaster appeal was enhanced because he spoke to an audience of one, despite having millions of listeners. Create a style and tone that reflects ‘prime of life’, vibrancy and individual experience, so your affluent over 50s messaging appeals to the person within, not a generalised characatured market segment. Some things consistently appeal to the affluent over 50s. Like quality, craftsmanship and uniqueness. They also want life made easy, time saved and not to be ripped off. Are your marketing messages addressing ‘how I’ll make your life easy’? Here’s how I’ll save you time? Here is my guarantee or solid proof? The over 50s prefer direct mail to email two to one. Which is why direct mail features as the preferred initial contact medium for many clients marketing to the affluent over 50s. The over 50s do more research before buying. They read more than their younger counterparts. That’s why Finely Fettled lead generation packages create linked landing pages for marketers to offer more information and help, long before the ‘ask’. Contact Finely Fettled now. Let’s discuss your opportunities to successfully attract the affluent over 50s. 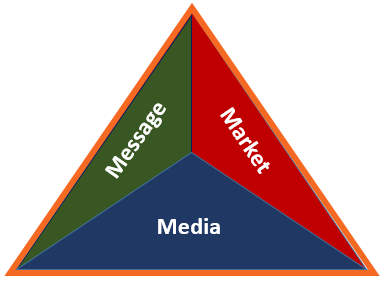 Message, market, media. Get these in harmony and your cash tills will be ringing. Finely Fettled helps businesses with all three. Why Consider Finely Fettled for Small Business Marketing? 3. Do all this in a state of healthy spirits!